The Shard: New Symbol of London? 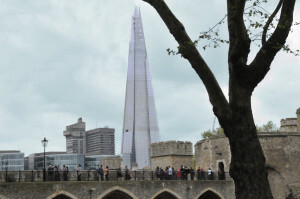 Critics of London’s “Shard” say it resembles broken glass. Erecting that building, the tallest in the Europe Union, required breaking barriers, both aesthetic and technical. In 2000, Irvine Seller, a London developer, got the idea of erecting a vertical city on the site of a building he owned just south of the River Thames, across from the Tower of London. Wanting not only to erect a building but to make a statement, he met in Berlin with Italian architect Renzo Piano, who sketched the design of an irregularly-shaped glass pyramid on a restaurant napkin. Seller immediately embraced the design concept, inspired by the masts of Thames sailing ships and London church spires, but a number of London heritage groups did not. One said the proposed building would be like“a shard of glass through the heart of historic London.” After an expensive public inquiry, the design was approved and the derision was adopted as the building’s official name. The site on which the Shard was to be erected was closely surrounded by other buildings, including a hospital, which required demolishing the existing 24-story building piece by piece. To save time and money, 23 stories of the concrete central core of the new building, to which the floors are attached, were completed before the basement had been excavated, a technique called “top down” construction that had never been used on a skyscraper. The concrete core rose nearly ten feet a day, with the forms aligned using GPS, another technique new to skyscrapers. Completed in 2012, the Shard is 1016 feet high and incorporates 11,000 panes of glass, enough to cover more than ten football fields. The glass reflects the changing colors of the sky, creating what some are beginning to regard as the new symbol of London. Critics are not sure they like that idea.